Droid4X is an ideal simulator of the original Android system. After downloading the Droid4X, PC users may have a virtual Android handset with individualized configuration and performance (subject to the PC's configuration & performance). The user may use the simulator to download the Android apps and games, and run/play them on a PC screen in a more convenient manner than the handset. 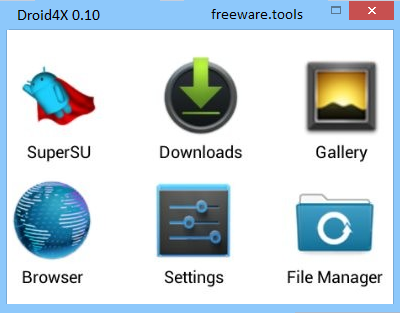 In simple terms, DroidX allows you to emulate an Android environment and run mobile games and applications on your PC with the help of this reliable and intuitive software that's extremely easy to use. Android smartphones are quite popular in a lot of countries, especially since most of them comes with powerful hardware that allows users to run a wide range of games and programs on their devices. However, if you want to enjoy your preferred software on a larger screen than the one of your phone, you can try Droid4X, as it can emulate an Android environment with very little effort on your side. The installation process should go along smoothly, without any issues, although it might take some time until it is finished and you can access the GUI of the app. It also need to be mentioned that, since Droid4X relies on VirtualBox to create a virtualized environment for running Android, some errors might occur if you already have VirtualBox installed on your PC. You can download VirtualBox from the official website here. It is best to either run Droid4X on a PC where the Oracle app is not already installed, or to remove it first, and only afterwards install the Android emulation software. Droid4X provides you with a nifty way of exploring the Google Play Store and choose whatever mobile games and programs might interest you. You also get the possibility to take snapshots or simulate a GPS app, as well as browse your preferred websites as if you were working on a mobile device. A nice feature of Droid4X is that you can install dedicated clients on your iOS or Android phones, then connect them to the PC and use them as joysticks within your games. This way, you can use your handset to control the game, while watching the action on the large screen of your PC (since Droid4X also supports full screen mode). All in all, the application can be of great use to all those who wanted to give various Android apps a try, but were not willing to also purchase a smartphone.